Egyptian President Abdel-Fattah El-Sisi met with Italian Prime Minister Giuseppe Conte on Monday and discussed the latest developments in the investigation into the murder of Italian student Giulio Regeni, as well as boosting cooperation between both countries in fighting terror and illegal migration, the presidential spokesman said. The pair met on the sidelines of the first-ever EU-Arab League summit, which was held in Sharm El-Sheikh. Regeni, a PhD student at Cambridge University who was researching Egyptian trade unions, was killed in Cairo in January 2016. The two leaders discussed the joint cooperation between Egypt and Italy to uncover the circumstances of the case, said El-Sisi’s spokesman Bassam Rady. They also discussed coordinating efforts with Egypt as a leading European Union partner in the fight against terrorism and illegal migration. 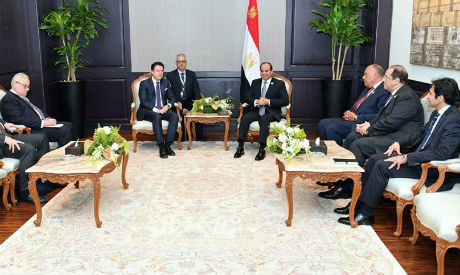 El-Sisi and Conte also talked about the development of economic, trade and investment relations between the two countries, especially in view of the development of the Suez Canal axis and energy trading projects, as well as cooperation in the fields of higher education and scientific research. The Italian prime minister stressed his country's keenness to strengthen bilateral relations with Egypt, particularly in light of the positive developments witnessed by the two countries during the recent period, praising the tangible progress in Egypt in terms of economic and social development. The two leaders also discussed the latest developments in the Libyan crisis. El-Sisi affirmed the Egyptian position on the necessity of reaching a comprehensive political settlement in Libya with the support of the United Nations, which is based on the implementation of the Libyan political agreement which will guarantee the country’s territorial integrity. The meeting also witnessed an exchange of views on developments in a number of African conflict zones. They also discussed the prospects for tripartite cooperation in Africa, particularly in the light of Egypt's assumption of the presidency of the African Union in 2019, focusing this cooperation on development areas through investing, and combating illegal migration and human trafficking.